At Moishe’s, we don’t just have the highest security features in storage in the nation. We also feature the metro tri-state area’s leading fine wine storage New York facility. We pride ourselves in the unparalleled customer service we provide to our customers. Our highly-trained wine storage specialists offer seamless transportation, inventory and invoice services for your personal or commercial wine collection. We utilize multiple temperature and humidity control technologies in our storage facility and vehicles to preserve the heady bouquet of your fine wines. Mana Wine Storage in New York utilizes humidity control within 2 degrees and 2% of the desired storage temperature range constantly, preserving your wine collections in ideal storing temperatures for climate, humidity and light transference. We have private lockers available for your collection utilizing our state-of-the-art temperature and humidity controls. We utilize computerized tracking with barcodes for the easy access of your inventory from the convenience of your home or office. Moishe’s also provides for delivery services anywhere in the metro NY tri-state area. Our unparalleled customer service-oriented team provides same day and next day pick up and delivery of your requested wines in storage with us. Located just 5 minutes outside of Manhattan, your fine wines are always convenient and accessible at Moishe’s Mana Wine Storage. Our vibration-free facility is the perfect place for wineries to store their collections, as well as restaurant owners, as our temperature and humidity controls provide the ideal environment for ripening flavors over time. Whether you are a restaurant owner or have a private collection you need to store, our 22,000 square foot wine storage facility can accommodate your collection, large or small. We offer online management tools and digital imaging for your collection that is accessible at any time. 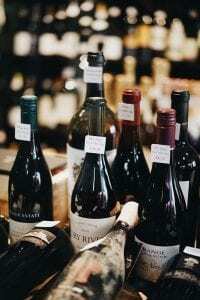 We host the wine collections of many hotels, restaurants and collectors in NYC. Mana Fine Wines has recently joined the Chaîne des Rôtisseurs, a French society dedicated to fine dining and preserving the camaraderie and pleasures of the table. Come in to our spacious, immaculately clean facility today and experience the inspiring nature of our service for yourself. Mana Wine Storage New York is located at 227 Coles St. in Jersey City, just minutes away from the city. Feel free to contact one of our fine wine storage specialists at (866) 292-5211 today and ask about our special rates. Mana Wine Storage New York is your ideal cellar away from home!